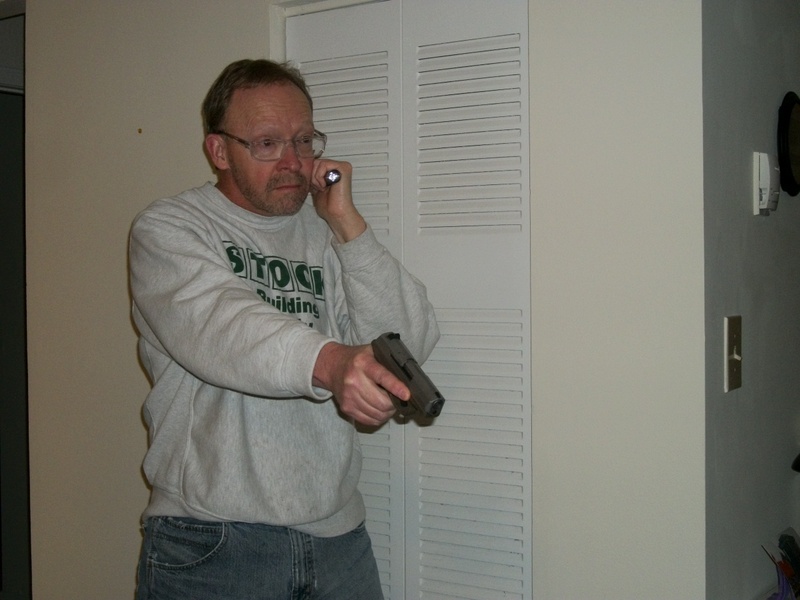 At night, have a flashlight next to your gun. 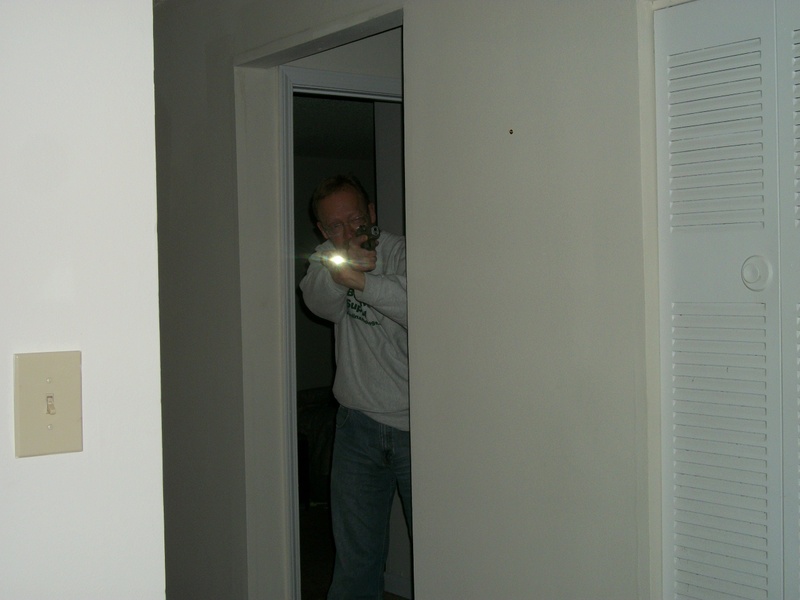 I emphasized very strongly about the need for keeping a flashlight next to your ‘nightstand gun’ during my Negative Outcomes presentation at the Rangemaster 2015 Tactical Conference. Although I practice dryfire with a flashlight regularly, it occurred to me that I don’t have a structured regimen for doing so. Tonight, I thought I would work on that a bit. 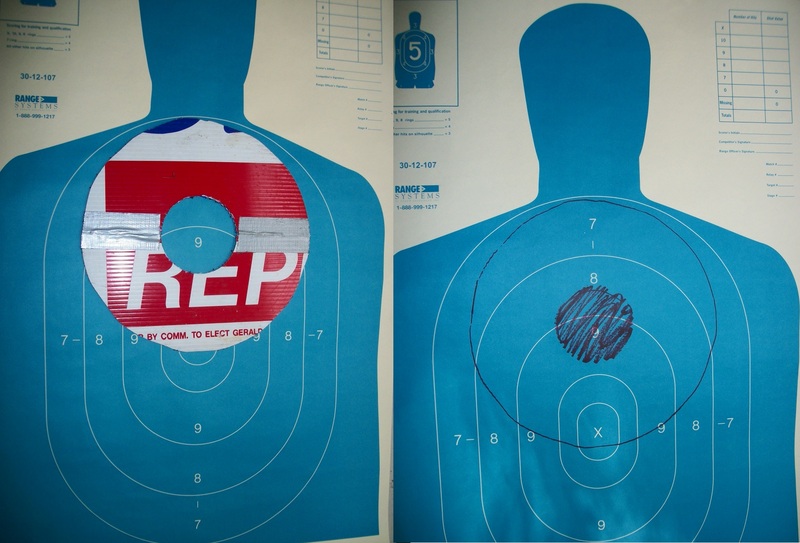 At first, I started doing my 12 shot drill on my dryfire range with the flashlight. I used the left column to practice with the Harries technique as my ‘outside’ technique. For a general search and ‘inside’ technique, I used the right side column. I just did it this way due to habit because that’s similar to the way I shoot the drill livefire. By ‘outside,’ I mean the flashlight is outside both my body and the pistol. ‘Inside’ means the flashlight is inside of the gun and toward my body. 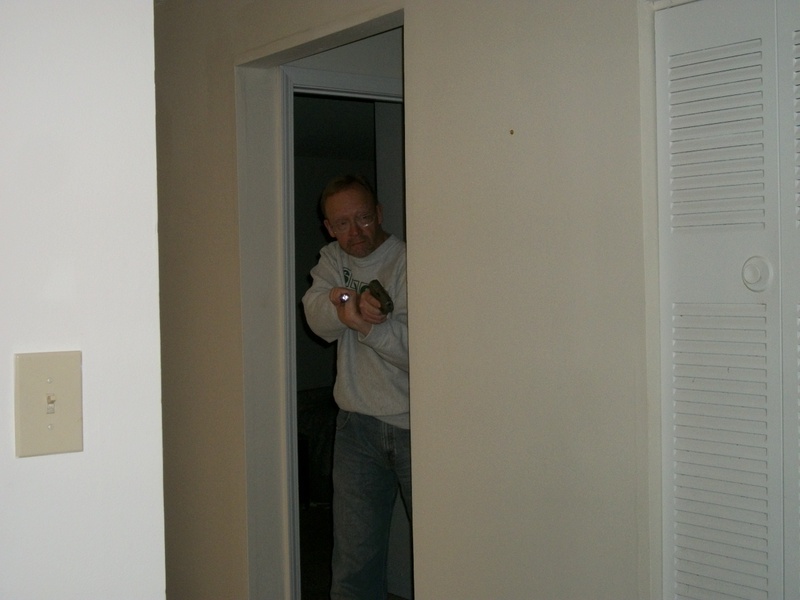 It’s necessary to have both an inside and outside technique so that you can use the light on either side of a piece of cover or concealment. For a right hander, the outside technique is used when using the light around the right side of cover and the inside technique is used around the left side. Left handers reverse that. It occurred to me that I could use the same setup I use for the Air Marshal Tactical Pistol Course. I’ve modified that target setup slightly so I get more traverse on the multiple target strings. My setup also allows me to use both inside and outside techniques because of the arrangement of my apartment. 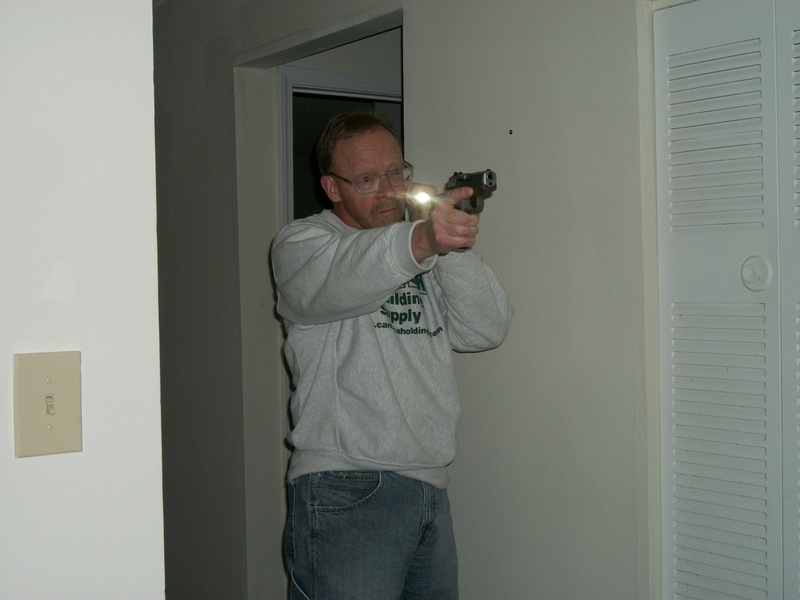 I started the Harries practice with the light pointing toward the target but the pistol down at low ready. Even when we’re identifying a target, we don’t want to muzzle them until the shoot decision is made. 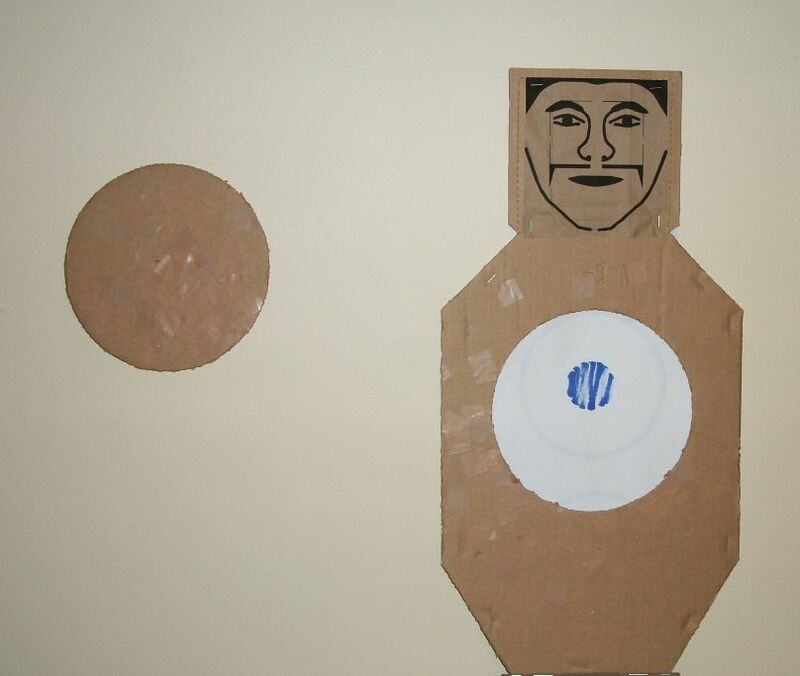 Then I practiced bringing the pistol up on target while keeping the light pointed at the target. At first, I did this in the hallway, just to get my mechanical movement correct. For the cheek practice, once again, I started with the light pointing toward the target but the pistol down at low ready. 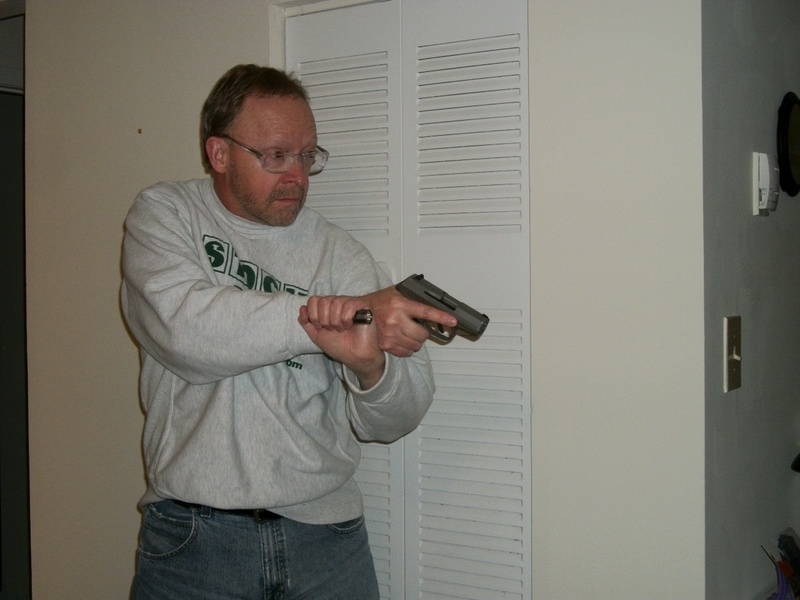 Since I use the cheek technique as a general search technique, this means I’m going to be shooting one handed, if the shoot decision is made. I like the cheek technique as a general search technique because it allows me to use the light as an impact tool, if necessary. 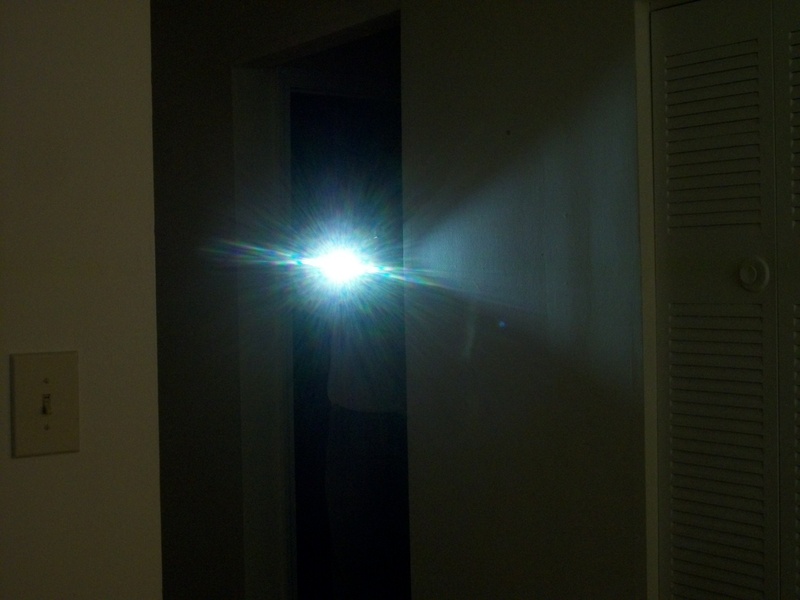 Because there is a possibility during a general search, I would be in a hallway when shooting started, I incorporated turning off the light after the shot and taking a sidestep. But, there’s not much maneuver room in a hallway, so don’t think this is some magic potion that prevents getting shot. Once I was satisfied I had the mechanicals down pat, I moved to positions of cover, both left side and right side. I practiced on both sides, making sure I didn’t splash the light off the wall and into my face. Note that in the photographs I took, I was using a flash or the regular lighting for clarity. When practicing, the place was completely dark. Also note that the camera wasn’t positioned exactly where the target was, so I look more exposed than I actually was. I’m glad I developed this as a more formal program. I’ll be doing it at least once a week from now on as part of my 1000 days of dryfire. How much you last practiced isn’t as important as when you last practiced. One of the Facebook groups I’m a member of is called 1000 Days of Dryfire Challenge. It’s a group whose members have committed to doing my ‘1000 consecutive days of dryfire’ concept. What I found the first time I did the 1000 days was that regularly devising new regimens and switching them around was important to keep the program interesting and avoiding boredom with doing a single regimen all the time. 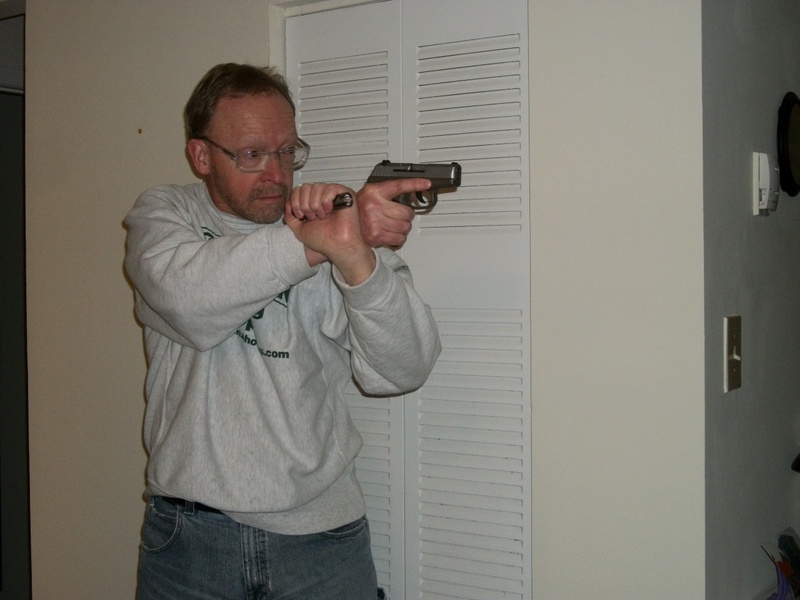 A regimen I’ve been doing the past few days is a dryfire version of the Federal Air Marshal Tactical Pistol Course. 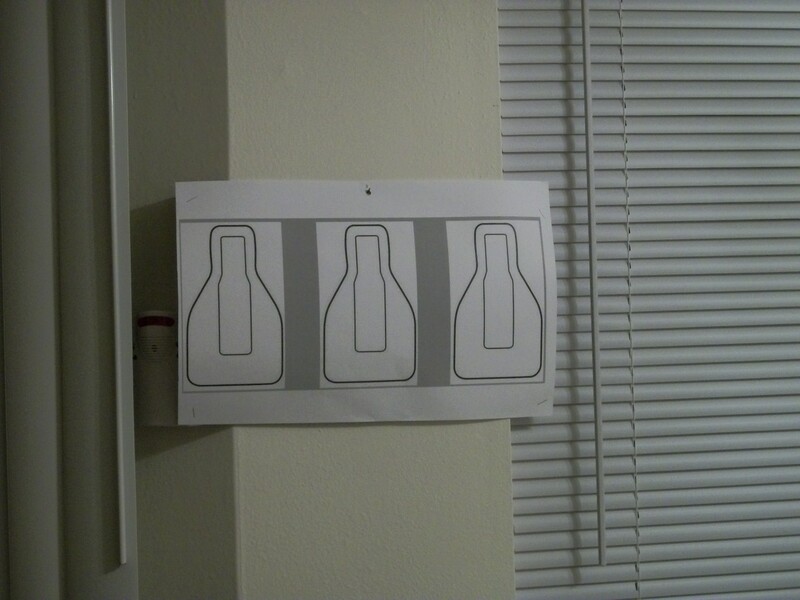 The target I made is a reduced scale triple QIT printed on 11×17 paper at FedEx Office. It’s scaled for 2.5 yards. What I do is print the image from a flash drive on 11×17 paper at FedEx office and set the copier to ‘resize to fit page.’ Resizing is one of the menu options when printing from a flash drive. Feel free to download the image and try it yourself. The spacing isn’t quite wide enough on a single piece of paper but nothing is perfect. I punched a hole in the paper at the measured middle point so I can hang it on a picture hanger in the wall. 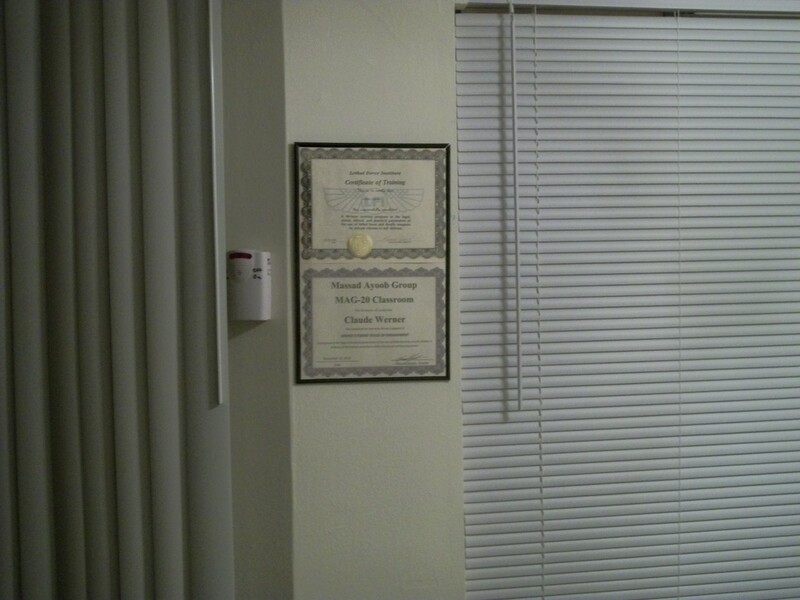 Regular paper tends to sag when hung on the wall, so I stapled it to a piece of cardstock. I’m using my SCCY pistol because it’s DAO with second strike capability so I can pull the trigger on almost all the shots. The only one I have to fudge is the final stage because it involves two strings starting with a slide lock reload. I start those strings with the slide locked back, so the first shot is a dead trigger. Since the TPC is based on Par times, like most police courses, I set the par times on one of my CED 6000 timers. It’s a great training timer, which isn’t made any more, unfortunately. The CED has an option for multiple strings of par time, which makes it easy to set up the multiple string stages. Like most timers, it only sets par times to one tenth of a second, so I round the times down, e.g., 1.65 becomes 1.6 seconds. TIME: Cannot exceed total time for each Drill. Example: Drill #1 – 1st time 1.70 seconds, 2nd time 1.55 seconds; Total = 3.25 seconds = Go. Must achieve a “GO” on each Drill. ACCURACY: Target is FBI “QIT” (bottle). Total rounds fired is 30. Point value that hit the inside bottle = 5. Point value touching line or outside bottle = 2. Maximum possible score = 150. Minimum qualifying score = 135. All stages must equal “GO” to qualify. This is a fun course that only takes a few minutes to do but tests a number of skills and is fun, at least for me. 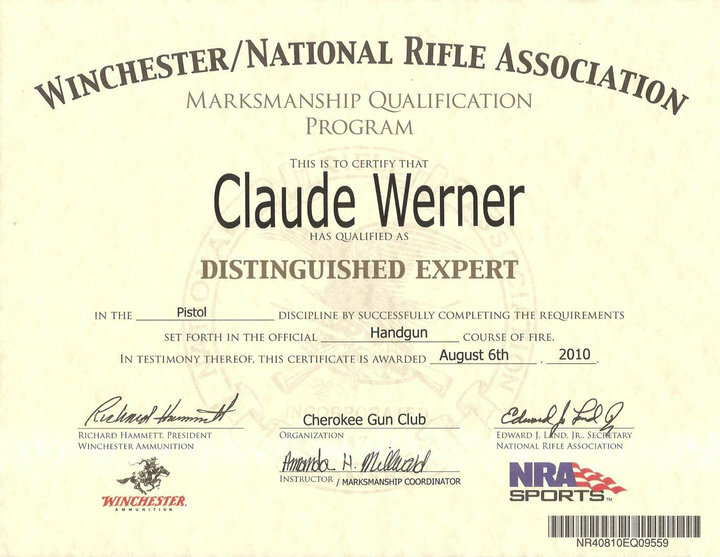 What exactly is Claude Werner’s ‘1,000 Day Dry Fire’ program? Is it published anywhere? Anybody tried it? What were the results? Would you do it again? This question was asked on a forum I visit occasionally. In a narrow sense, the question refers to an idea I had a while ago. About 12 years ago, a friend was working on his Yoga instructor certification and had to do 1000 days straight of meditation. That inspired me, so I decided to do it with dryfire. He said that dryfire is my form of meditation; I will defer to his judgment on that. Another friend of mine wanted to try it last year, so I’m doing it with him now, my second time, his first. We’ll be finished at the end of 2015 but we both agree it’s become such a habit that we probably won’t stop then. First of all, the ‘program’ is not any particular drill or set of drills. Rather, it’s the commitment to do dryfire each and every day, without fail, for 1000 straight days. If you miss a day, you have to start again at the beginning. The important thing is do some dry practice every single day, even if it’s just a little. My last trigger press is never more than 24 hours in the past. Days that I practice livefire are not exempt from the dryfire requirement. I like to finish each range session with a few dryfire trigger presses. The first time I did the program, when I was at the GF’s house, I’d do it in the bathroom by using the tile intersections as targets. She finally figured out what I was doing and had me set up a little dryfire range in the spare bedroom. The range consisted of a reduced size target behind a picture and a cassette tape I had made with a specific regimen on it. Eight minutes and I was done. The reason there’s not one drill or set of drills is to avoid boredom. I regularly change up my regimen. 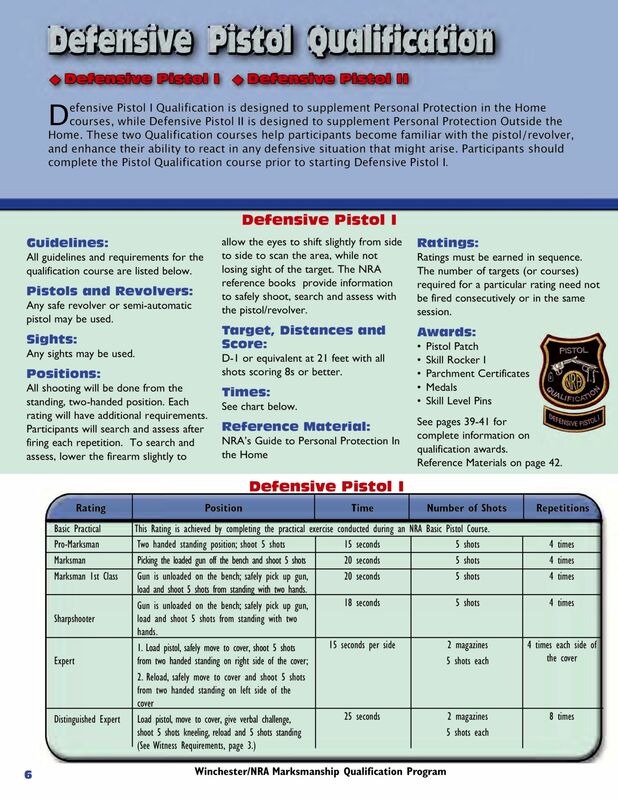 Run different qualification courses dryfire, practice bullseye shooting, run the NRA Defensive Pistol I & II, etc. It doesn’t matter. 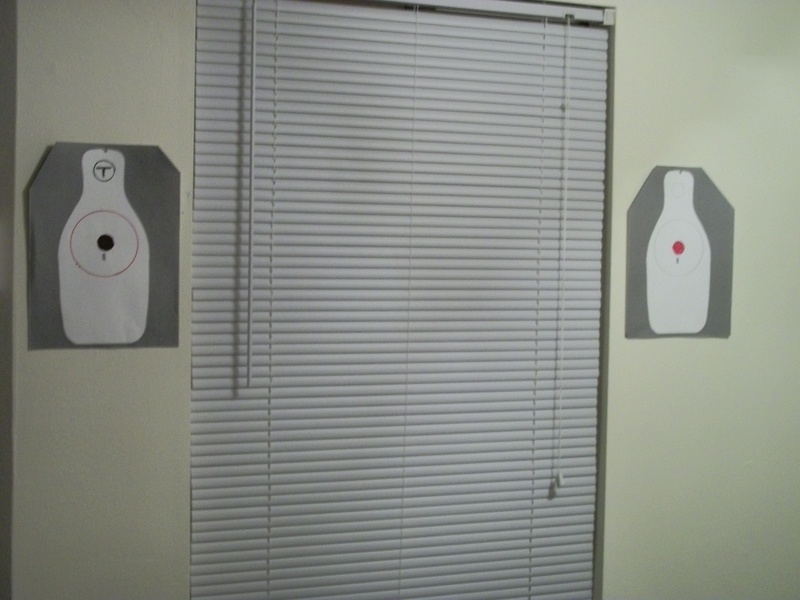 I make different targets and reduced size target arrays from time to time to change things up, as well. The most important aspect of the program is that it represents a philosophy of practicing our skills on a regular basis. Those skills might be shooting, threat management, surveillance detection, pepper spray, unarmed combat, etc. Any physical skill is perishable, meaning after a length of time, it’s not as easily performed on demand. The ‘riding a bicycle’ analogy does not completely apply. When we get back on a bike after a long time, we have some time to refresh ourselves with those motor skills. If someone is attacking you, a refresher session for your personal protection skills is not an option for you. You need to be on your game at that point. Shooting skills are especially perishable for those who have never become Unconsciously Competent at them in the first place. That’s most people, frankly. I dryfire even when I shoot an IDPA match. When I go through the “Unload and Show Clear” process, I don’t just do a trigger mash at the hip like most people. I pick out a spot on the berm, aim at it, and do a good dryfire trigger press. What I don’t want to do is to ever program myself to do a motor skill in a sloppy or detrimental way. As a friend of mine once remarked, “Claude doesn’t do anything that doesn’t have a purpose.” My cardiologist told me “You are a very programmatic person.” Both of those are completely true, to the extent I can make it that way. Many people think they will never use elementary algebra once they leave high school but sometimes it still comes in handy. The above question can be simply solved through the use of cross-multiplication. The first part of the problem is we have to determine the ratio of the two distances and then solve for the correct size (height) of the target. 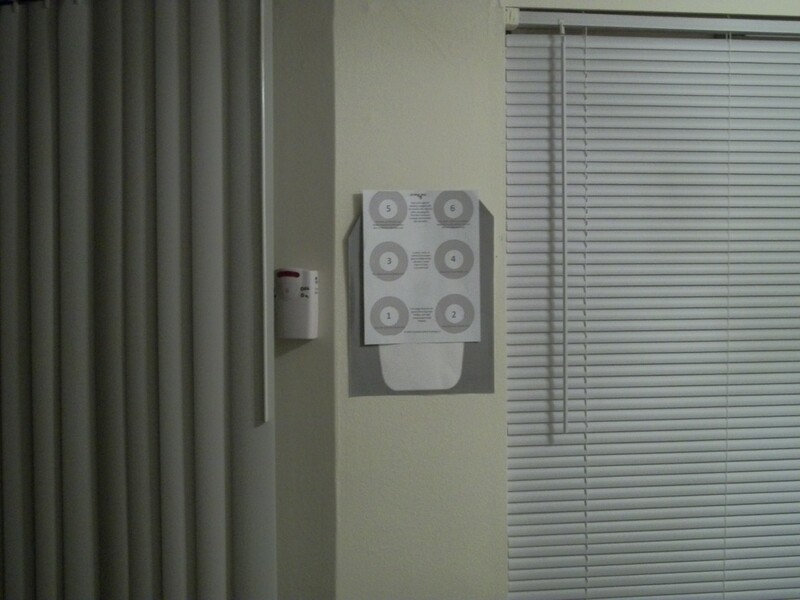 The IDPA target is 30 inches tall and would be full size at 25 yards. How tall would it be at seven yards? Cross multiplication means the product of the upper left and lower right will be the same as the product of the lower left and upper right. So, 30 times 7 will equal 25 times x. This works out to 210 equals 25x. But we only want 1x, so we then divide both sides by 25. Our answer is 8.4. 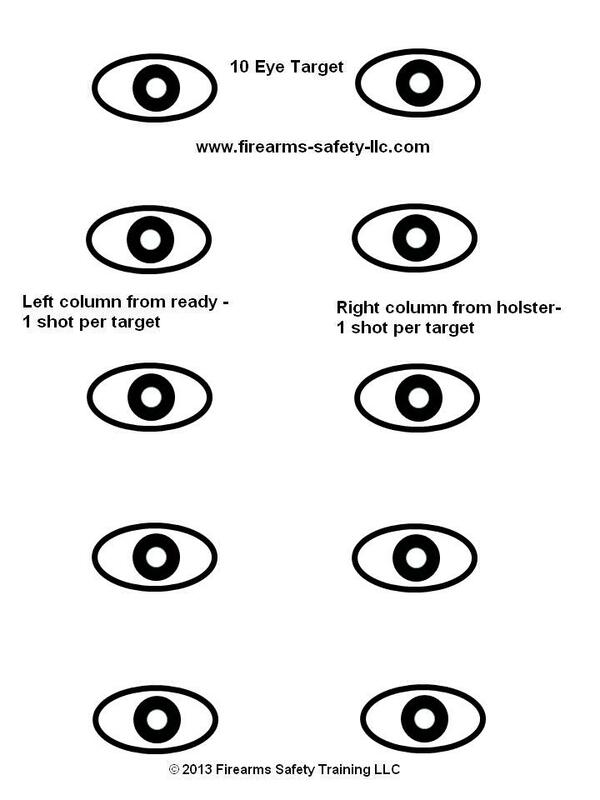 I.e., a target 8.4 inches tall at seven yards will have the same size ratio as a full size (30 inch) target at 25 yards. Granted, there are depth perception and visual acuity issues that come into play but it’s an imperfect world and we just do the best we can. 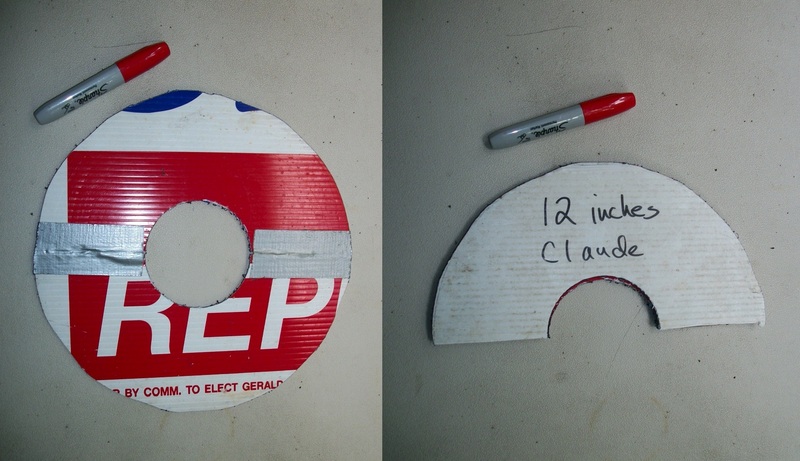 The second part of the problem is to make a target 8.4 inches tall out of the images available to us. I did this using crude methods but effective. 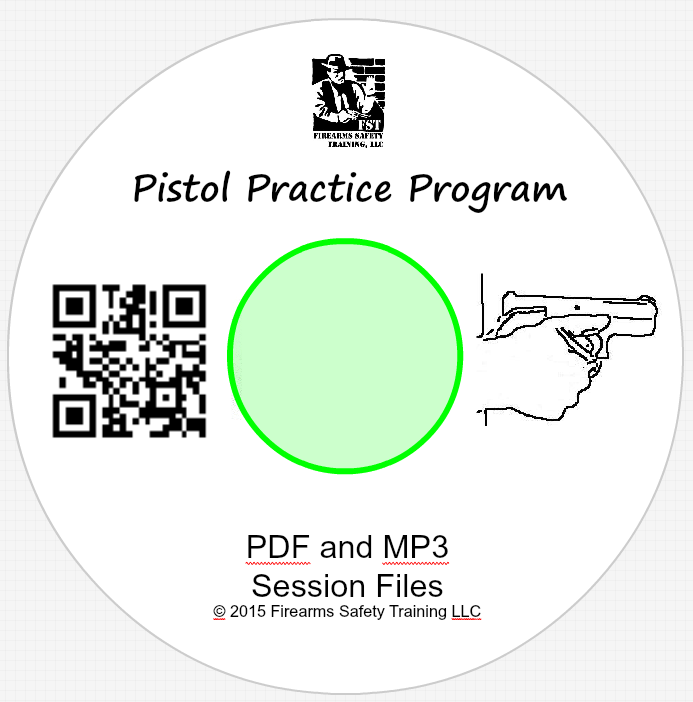 Using an IDPA target image captured from the internet, I sent it to Print Preview. The original size was way too small so I took a guess and enlarged it to 400 percent. I then took a ruler and measured the preview pane, which was 2.25 inches tall. This makes a relationship of 2.25 inches to an actual print page of 11 inches. The target image height is 8.4 inches so the task is to find the representative size on the screen. Cross multiples again can provide the answer. This gives us 2.25 times 8.4 equal 11x. 18.816 equal 11x. 18.816 divided by 11 gives us 1.72, the desired screen height. However, the 400 percent image on the screen only measured 1.375, so I needed to find the correct print percentage. Doing another cross-multiplication answers that question. Solving for x gives 500 percent, which I then printed and verified. Since I do this regularly, I have a scaling spreadsheet set up in Excel. It allows me to do this kind of scaling in less time than it probably takes to read this post.